There are more than a few popular horror game series out there—from classics like Resident Evil and Silent Hill to more modern hits like Dead Space and Amnesia. But for me, one series stands tall above those: Fatal Frame. Let’s be clear from the start: I do not like horror in general—neither in games nor film. I simply do not like being scared. More than anything, this is because I am one of those people with an overactive imagination. Playing a horror game means I will be having nightmares that night that are far more graphic and gruesome than anything you’ll see in the game. What can I say? I like my sleep calm and peaceful. Yet, after getting a free ticket to see The Ring back in my college years (and being haunted by the experience for months), I developed a bit of a soft spot for Japanese horror. And that is how I found myself playing the original Fatal Frame with a group of friends. That first time through, I was just watching (though I have of course played through the whole game on my own in the time since) and while terrified most of the time, I was also hooked. 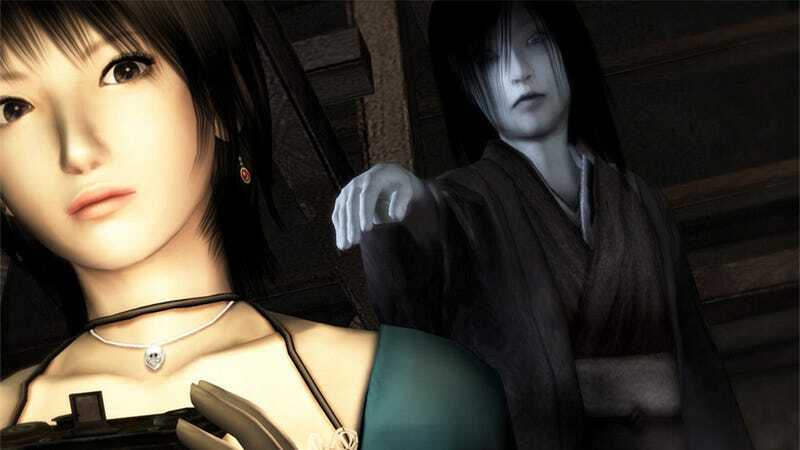 The Fatal Frame series succeeds because of its general framework. There is always some sort of supernatural calamity that causes the setting—i.e., mansion, village, mental hospital—to become a haunted land of no escape. Also common to the framework is the reason for the calamity: Somehow an ancient ritual which is supposed to prevent the calamity was not performed or did not work properly. Because of this, each game is primarily damage control. The worst has already happened/is continuing to happen and now people are getting pulled in to a fate worse than death. Thus, someone always ends up going into the haunted area looking for a missing friend or loved one—and subsequently ends up unable or unwilling to leave the area. Then it is up to that character to discover the mystery behind the calamity and how to fix it. The settings are always creepy, taking place in abandoned Japanese buildings. But while there are many jump scares in the game, the truly scarey bits are contextual—coming from a sense of dread that has been building over hours. Never do you want to enter a room filled with Japanese dolls, pass through the site of a bizarre ritual, or open the mysterious box that has suddenly appeared in a room you have passed through many times before—but you just know you’re going to have to do it. Another part of what makes the series so scary is how the characters interact with the environment. There is no running in Fatal Frame—at most, the characters move at a measured jog. Rarely can you outrun a ghost by speed alone; and in a series where movement is key, this is equal parts terrifying and frustrating. But the real master stroke from Fatal Frame is your weapon: the Camera Obscura. This is simply the only weapon you have against the ghosts and it comes with a fear-inducing drawback: It entirely cuts off your peripheral vision. To use any of the several iterations of the Camera Obscura, you must look through the viewfinder of the camera, thus greatly limiting your vision. And as you are fighting ghosts that often times can teleport, you often lose your target only to find it again mere moments before its horrible visage feasts upon your soul. Moreover, as you are often limited on film (or at least limited on all film except for the weakest variety), you can't simply take pictures of the ghost non-stop. It is far more effective damage-wise to wait until the ghost is in mid attack at point blank range—i.e., the scariest moment—to snap your shot. There is also a surprising amount of tactical thinking required in Fatal Frame which I truly enjoy. Not only does each ghost have its own attack patterns that you have to memorize, but learning to deal with the obstacles in the surrounding environment is also vital. More than any ghost, narrow hallways are your greatest enemy in a Fatal Frame game. A ghost can simply hide inside a wall and then attack, giving you only the slimmest margin to react. Thus, it is often smart to keep track of nearby open areas or rooms to run to if you encounter a ghost. Also, remembering the layout of any room you are in is important as that information will allow you to move around safely while looking through the viewfinder of the Camera Obscura. It’s nice to find a game where retreat isn’t just an option; instead, it’s sometimes the best possible one. And while simply outrunning the ghosts rarely works, they do tend to get stuck at doors. And this knowledge can save you from both using film and taking unnecessary damage. In the end, it’s the story, environment, and gameplay that make Fatal Frame my favorite horror series—even though playing it gives me nightmares for weeks on end. …And it doesn’t help that I have an old-fashioned Japanese bedroom either.